There is something about the first of August that makes me start planning for fall. I’ve mentioned looking at fall fashion, but it’s bigger than that. Summer is great. Long sunny (or rainy) days, nonstop novel reading, writing, golf, tennis, swimming, vacations, and a slower pace. I love it. We all love it. Less structure feels so good. But it is that very lack of structure that hits me on the head the first day of August each year. I begin to feel antsy. I know that in Arizona we have another two months before we can count on anything even similar to fall. Other parts of the country consider Labor Day that turn toward winter, but the desert doesn’t comply until late October. This morning I drove to the library to return the novel I finished reading last night and I swore I was not getting another. In the past eight weeks of summer, I have read at least a dozen. I’m tired of reading. My eyes are bleary, my hands swollen from holding the hard back books, and my neck cricked permanently toward my belly button. I’m sick of the buzz of the fans as they move air through my apartment. I’m even tired of the gorgeous night skies with stars so close I feel I could touch them. I’m sick of all the little touristy shops in the little town where I stay. I’m sick of the six restaurants and the two dollar stores and the bakery. That’s a lie – I will never be sick of the bakery. So today I got out the calendar and turned the page to September. Ahhh. I felt better immediately. 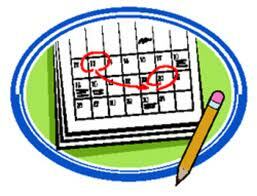 Volunteer at the elementary school each Wed.– write that on the calendar. I may volunteer a second time – one evening per week with parents. I’ll choose Thurs. for now and write it in pencil. A creative writing course at the college. Tues and Thurs. mornings. I look on-line for a fall writing conference anywhere on the west coast. I plan my fall garden – small as it is. I’ll need to prepare the soil soon. I decide to retake a Speedy French course on Monday evenings. I make a note to order those cabinets for the garage and buy the screen door for the back patio. I try to remember if I bought a navy blue sweater last year. I’d like a navy blue sweater – cashmere maybe. I get back online and look for end of summer sales on outdoor patio furniture. I need a new chaise. Seeing those notations in pencil on my once empty September page fills my heart with joy. Busy at last! I know for certain that by May of 2014, I will be planning a trip up north. I will be tired and cranky and wishing summer would arrive. Ah, two months with nothing to do! I know – we humans are crazy, right? Or is it just me? Don’t answer that. This entry was posted in Uncategorized on August 8, 2013 by cwesala.